Being a human being is tough. I could have started with something a little more narrowed down and specific to me like Being a woman is tough. Being a mom is tough. But it just seemed to discriminate against too many people, and I strive to include everyone. So, when Happy Planet contacted me to let me know that they will be at the National Women’s Show this weekend and that they want to give one of my readers a prize pack worth $90, I thought immediately about the story of Happy Planet and why what they do is so great. Because being a human being is tough. Living in this world is tough. Making ends meet is tough. Trying to eat healthy, be healthy, live healthy and take care of our planet is tough. And try doing all that while being happy. 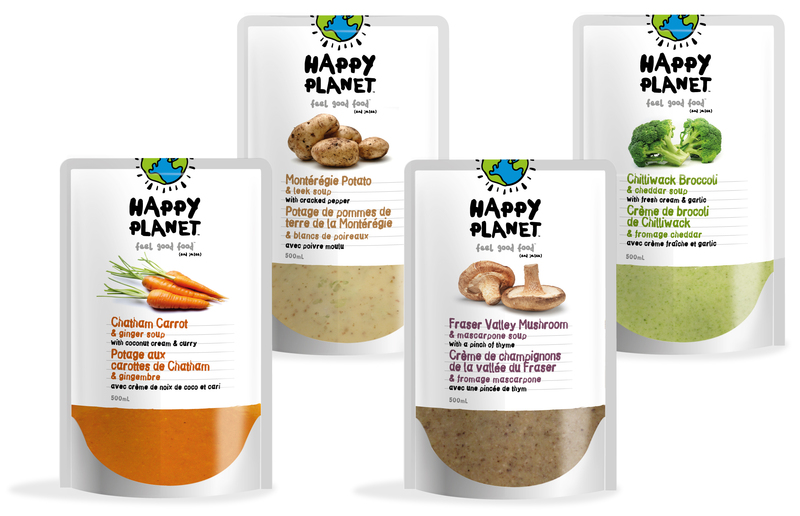 Happy Planet is all about “feel good food (and juices)”. It’s organic juices, smoothies and soups created by two friends in Vancouver (Canadian!). And they have this great program that helps Food Banks across Canada! Leave me a comment below with the name of your favourite Happy Planet product or a product you’d like to try. The winner will be drawn Thursday morning at 8 a.m.
Want another way to win? This entry was posted in Uncategorized and tagged Betterment, Canadian product, eating healthy, Family, Food, food, Happy Planet, Media, National Women's Show, organic food, organic juices, Parenting on October 30, 2013 by Nancy. I’ve never heard of this brand before and would like to give the Chatham Carrot and ginger soup a go! What a great program. I would love to try the Organic Coconut Water & Mango Juice and the Coconut & Pineapple Fruit Smoothe! (Can you tell I have a slight obsession with Coconut!). I’ve always wanted to try the Chatham carrot and ginger soup. Sounds really tasty! I will always be a fan of the Extreme Green smoothie (though Extreme C is a close second when I feel a cold coming on). Alicia Louise, you’re the winner of the Happy Planet prize pack! Congratulations! Please email lifetakesover@yahoo.ca to arrange for your prize.